History, Labor, Life: The Prints of Jacob Lawrence will be on view at the Harn Museum of Art at the University of Florida from Feb. 13 to Aug. 5, 2018. This traveling exhibition provides a comprehensive overview of influential American artist Jacob Lawrence’s (1917–2000) printmaking oeuvre, featuring more than 90 works produced from 1963 to 2000. Jacob Lawrence (1917–2000) was mentored by Charles Alston and heavily influenced by the writers and artists of the Harlem Renaissance. After receiving a scholarship to the American Artists School in 1937, he soon distinguished himself as an exceptional voice in American painting. From 1941 until 1953, Lawrence exhibited regularly at Edith Halpert’s Downtown Gallery, New York, and throughout the 1950s and early 1960s, he was a regular participant in annual exhibitions at the Whitney Museum of American Art, New York. Today, Lawrence’s work is represented in almost 200 museum collections, including the Art Institute of Chicago, Illinois; the National Gallery of Art, Washington D.C.; the Brooklyn Museum of Art; the Studio Museum in Harlem; and The Metropolitan Museum of Art, New York. Lawrence was the first African-American artist to be represented by a major commercial gallery. During his prolific career, Lawrence was presented with numerous awards and accolades. He earned the National Medal of Arts and was the recipient of 18 honorary doctorates from universities including Harvard University, Cambridge, Massachusetts; Yale University, New Haven, Connecticut; New York University, New York; and Howard University, Washington, D.C. He was a member of the American Academy of Arts and Letters and served as a commissioner for the National Council on the Arts. Jacob Lawrence, “New York in Transit I,” 1998, silkscreen, edition of 50 with 5 AP, © 2015 The Jacob and Gwendolyn Knight Lawrence Foundation, Seattle / Artists Rights Society (ARS), New York. The exhibition explores three major themes that occupied the artist’s graphic works. Lawrence started exploring printmaking as an already well-established artist. Printmaking suited his bold formal and narrative style exceptionally well. The relationship between his painting and printmaking is intertwined, with the artist revisiting and remaking earlier paintings as prints. The inherent multiplicity of this medium provided an opportunity for the artist to reach broader audiences. Jacob Lawrence, "The Card Game," tempera on board, 19" x 23½", 1953. Gift of Dr. Walter O. and Mrs. Linda J. Evans. SCAD Museum of Art Permanent Collection. © 2017 Jacob and Gwendolyn Knight Lawrence Foundation, Seattle/Artists Rights Society, New York. Lawrence was primarily concerned with the narration of African-American experiences and histories. His acute observations of community life, work, struggle and emancipation during his lifetime were rendered alongside vividly imagined chronicles of the past. The past and present in his practice are intrinsically linked, providing insight into the social, economic and political realities that continue to impact and shape contemporary society today. 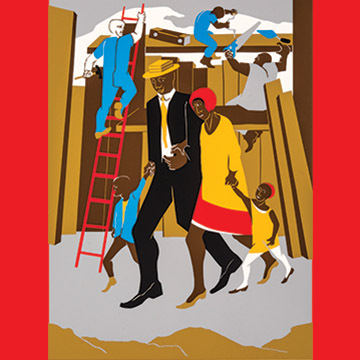 Jacob Lawrence, “The Builders (Family),” silkscreen on paper, 34” x 25.75”, 1974. © 2018 The Jacob and Gwendolyn Knight Lawrence Foundation, Seattle/Artists Rights Society (ARS), New York. History, Labor, Life: The Prints of Jacob Lawrence is organized by SCAD Museum of Art in collaboration with the Jacob and Gwendolyn Knight Lawrence Foundation, and is curated by Storm Janse van Rensburg, SCAD head curator of exhibitions.